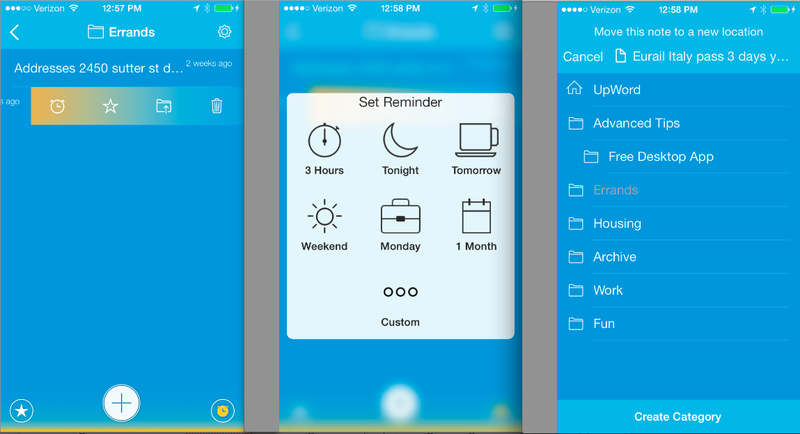 Sometimes it only takes a little bit of app magic to make one's life a whole lot easier. Today's magic comes in the form of UpWord, a simple note taking app for iOS that just launched in the app store. It's like your default "Notes" app but much better. If you're anything like me, Notes is where your reminders to yourself go to die. Mine is overflowing with odds and ends of information, an address here, a recipe there, a to-do item that never got done. I'm constantly coming up with tidbits I need to write down, post it style, and Notes is the trashbin. Without an easy way to organize the tidbits, they disappear into cellphone ether. UpWord aims to simplify that with a simple folder-ing option, as well as some helpful shortcuts. A swipe left on a note gives you the option to time it to notify you later (3 hours, Tonight, Tomorrow, Weekend, etc), file it into a folder, favorite it, or trash it. If you want to file it away, it takes you straight to the folder screen where you have the option to add a new one if you so chose. And of course, there's a Dropbox integration option. Lastly, you can add bullet points by swiping left on a Note line, or cross off a task by swiping right, pulling down to delete anything crossed off. Sure there's other apps that might accomplish the same tasks. In fact, there's at least 100 such apps to be precise. Upword falls into the nice little niche of not being nearly as feature-laden as something like Evernote or OmniFocus, but being one step up for organizing than the Notes app itself.